Could not believe the excellent value!! Ample space, kitchenette, city skyline views and central location. We’ll be back! Great location. Clean room and lovely helpful staff. The pool area was great. Friendly helpful staff. Room was clean .....bathroom exceptional! Excellent reception staff and amenities within the complex. 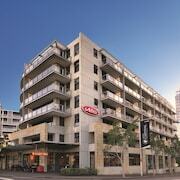 Looking for a sensational place to stay in Sydney, the capital of New South Wales? Whether you're on a cheap wine or champagne budget, you'll find a great hotel in Darling Harbour, 1 kilometre from the centre. There's no such thing as being bored in Sydney. Check out iconic sights like Bondi Beach, Sydney Opera House and Sydney Harbour Bridge and make sure you humblebrag to your friends at home afterwards. Too stuffed to travel miles away? Looking for a lodging near Sydney Opera House? Simple. Try the Park Hyatt Sydney, Pullman Quay Grand Sydney Harbour, The Darling at the Star, Quay West Suites Sydney and Establishment Hotel. History aficionados will adore a visit to Elizabeth Bay House. Jump on a tour, stroll around the historic property and learn the stories of past lives. You'll find a few places to crash within close reach. 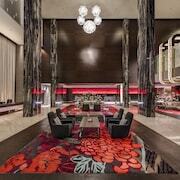 The Langham, Sydney and Fraser Suites Sydney are terrific spots to rest your weary noggin. Take a leap, if you dare, into a time of crimes and misdemeanours at Fort Denison. Accommodation choices to check out around here are the Sydney Harbour Marriott Hotel at Circular Quay and Harbourside Apartments. Want to set up shop in Darling Harbour but don't want to burn through all your savings? Take a look at the bodacious deals at the Woolbrokers at Darling Harbour. You'll want to book in quickly though, as this is one of the only budget hotels here. What else are holidays for if not splashing out? 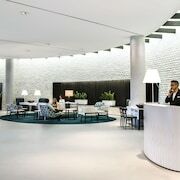 The Astral Tower and Residences at The Star and Novotel Sydney on Darling Harbour are our picks for those travellers who aren't scared of throwing down a few more coins. Ready to celebrate the start of your holiday with a few beers or some vino? Pyrmont Bridge Hotel is the place to go. If it's a hot coffee you're after, Cafe Tango Espresso do an awesome one. 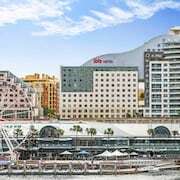 If you and the squad are having difficulties finding the best Darling Harbour hotel deal, look into our Pyrmont hotels guide. 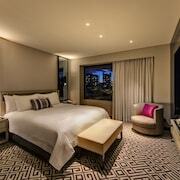 Alternatively, our lastminute.com.au Sydney hotels guide has options for you. So, have a quick look at the Darling Harbour weather report, pack a few of your favourite outfits and get going! You're only a few clicks away from great nights and epic adventures!